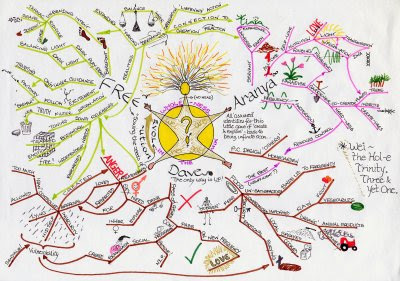 If you've never been exposed to mind maps, rejoice! Today is the day that you will pick up one of the most effective headache remedies. Mind maps (or similar concepts) have been used for centuries, for learning, brainstorming, memory, visual thinking, and problem solving by educators, engineers, psychologists and people in general. Some of the earliest examples of mind maps were developed by Porphyry of Tyros, a noted thinker of the 3rd century as he graphically visualised the concept categories of Aristotle. Ramon Llull also used these structures of the mind map form. 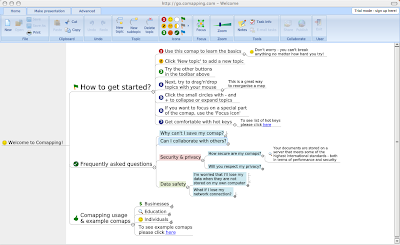 Comapping.com is a Flash-based Office2.0 application that comes as close to perfect Mind Map implementation as I've seen! Not only does it support all the standard functions of a mind mapping package, it provides an excellent collaborative experience!!! (this is what office 2.0 is about folks) You can work on a mind map with your colleagues like if you were in front of a white board. It also supports tasks so you tally up all the tasks produced by the model at the end of the exercise and email them out. I've been using this tool for over 1/2 year now and it's robust and well-designed. About the only gripe I have is that all the branches are laid out to just one side, but I can live with that. Oh, the best news is it's only $9.99 for 6 months! Try it out, let me know what you think. I bet you will like it. This shows what's free (and how much the subscriptions are for the others) and, of course, where to find them. Comapping is there but so are many more. vic-vic, most of them are supported somehow, either through fees or through ads. If they are not supported at all, it means that they are an experiment and will not be developed further, or worse, will be taken off-line soon. I agree, stay away from totally unsupported ones, but we can all ignore ads, can't we? I must admit I don't like the left-to-right rigidity of Comapping - to me it's more a graphic outliner.